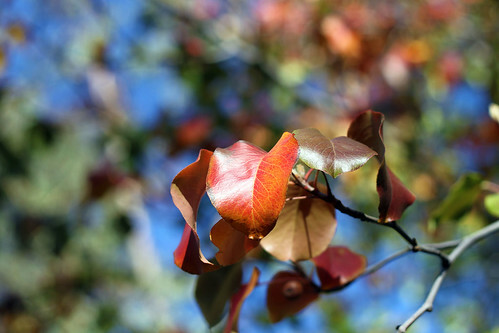 Our trees start turning color about this time of year. Instead of falling snow, we get leaves to rake. Here are a couple of photos I took yesterday. I love when our desert sky turns this deep, clear blue. 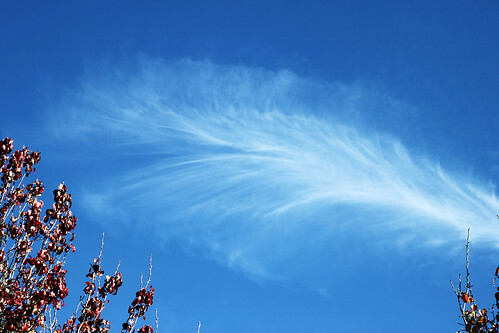 I think the feather cloud may have been made by a jet. I thought it was pretty. I have been playing with the new sewing machine. I tried out the embroidery module and am pleased with how it worked. I do not have photos yet. Soon I hope to have something to share that is craft related. I am the one doing most of the paper work on my MIL’s estate. Even though her estate is small, there have been a few things that have made things more difficult. One is leaving utilities and other accounts in a deceased person’s name. My MIL, as many women in her situation do, leave their deceased husband’s name on accounts. It is one less advertisement to the world that they are living alone. It has however made keeping the utilities on until escrow closes a little more difficult, especially since we have a California address. I was able to do it with lots and lots of faxes. This entry was posted on Sunday, December 6th, 2009 at 3:00 am and is filed under Life. Tagged: Life. You can feed this entry. You can leave a response, or trackback from your own site. Your ‘fall’ photos are beautiful! Sounds as if you are making really good progress with MIL estate – these things can be very tricky. When my FIL died, my husband decided to just pay a lawyer. His mother was (and still is) alive and he felt he needed all his spare time and energy for her. Such a difficult journey you are making…so many of us do truly understand all the emotions experienced during a time such as this. My husband’s parents lived on the East Coast & trying to reconcile & finalize everything from so far away was difficult too. We can just do the best we know how. Your photos speak gently what words cannot describe. The kitchen alcove with the arch is just so dear & I can picture your MIL being very comfortable there. Hold on to those good memories.